A few upcoming talks this month and next… London, Birmingham, Hertford and Madrid! Tuesday 22nd January (tomorrow), a talk to Herts County Council staff on the potential and impacts of transformational change in how we travel. Thursday 24th January, I’m speaking on qualitative research on perceptions of driving and cycling (completely new presentation, based on a paper from the People & Places study) as part of UDL’s Cycling Review. Thursday 31st January, *three* talks. 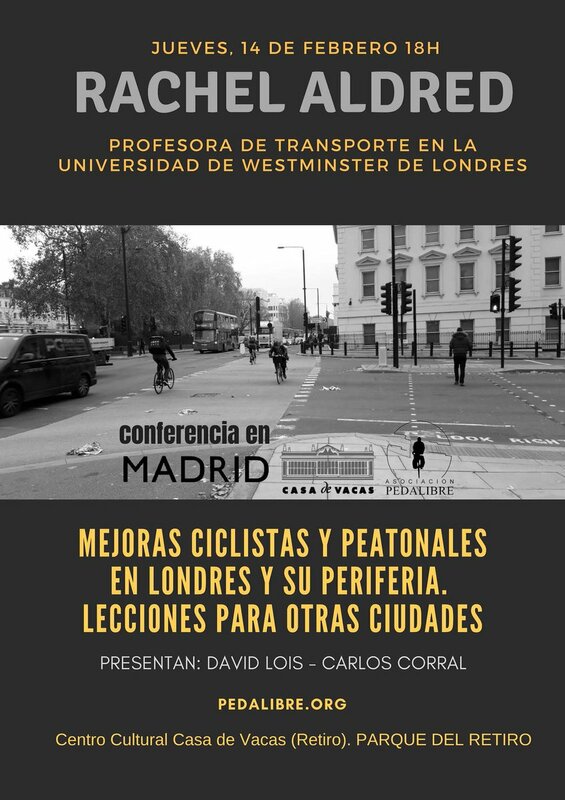 Firstly a keynote at the ACT TravelWise conference in Birmingham, secondly a phone seminar for the Faculty of Public Health Sustainable Development Special Interest Group, and finally I’m speaking at an evening event on low-traffic neighbourhoods back in London for Urban Design Group/London Living Streets. And in February, my first talk in another language! I’ve been making a serious attempt to learn Spanish since September 2017, and figured it was time to give it a go and start trying to use my Spanish for professional activities. Madrid, Casa de Vacas, 14th Feb at 6pm.